1 Heat oven to 190C, Gas 5. Spread aubergine slices over a baking tray and drizzle with 2tbsp oil and roast for 20 mins until tender. 2 While these are roasting cover the lentils and stock cube with cold water, cook on a medium heat for 25 mins until soft. Drain and set aside. 3 Fry the onion, pepper and garlic in a non-stick frying pan for 5 mins, until soft. Add tomatoes, oregano and lentils. Stir until heated through and season. 4 Mix the eggs and yogurt together and season. 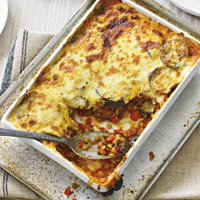 Pour half the lentil mix into a 1.4lt ovenproof dish, cover with aubergines and repeat. For the final layer pour over the egg mix and top with grated Cheddar. Bake for 30 mins until the topping is golden.